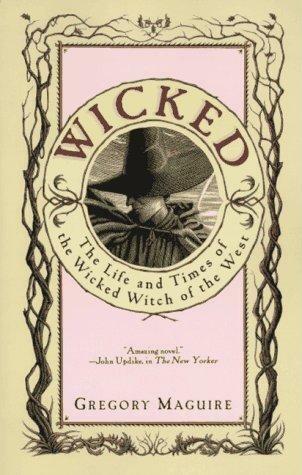 After developing a taste for Gregory Maguire’s writing style I decided to tackle the Wicked series. Wicked is the story of the witch from the story of Oz. Maguire blends elements of the original Wizard of Oz, not the movie, with his own imagination, providing a ‘background’ for not only the witch, Elphaba born with a green skin and sharp teeth, but also for the Lion and Tin Man, weaving their stories into Elphaba’s. From her birth to her death we see Oz through her eyes, giving us a completely different view of good and evil. Was the witch evil or merely misunderstood? The continues along through Elphaba’s early childhood, then jumps to her going to school. A sort of university, we learn of what happened in between by conversations Elphaba has with her new friends and later in the form of flashbacks and comments by Nanny. A woman who took care of Elphaba’s mother, then Elphaba and her siblings. The end is written in such a way to convey Elphaba’s frustration with how her life has turned out. I also thought the ending was really well done, arranging the ‘murder’ of Elphaba to fit with Dorothy’s personality. Overall I found this to be a compelling read. I gave it 4 stars and recommend it. Posted by Belleza on February 10, 2012 in 2012, Fantasy, Novel and tagged 4 Stars, eBooks, Gregory Maguire, L. Frank Baum, Library Book, Recommended to read, Wizard of oz.